Writer, Harvard-trained board-certified gynecologist, yoga teacher, mom. I believe in evidence-based ancient medicine. My specialty: bioidentical hormones + botanicals. I've partnered in, predicted, and personalized healing with women since 1989. For more info, visit www.SaraGottfriedMD.com. Return to balance, naturally™. After many requests, I am re-posting this from my other blog as it is consistently the most popular and my patients seem to love it. It does not include enough questions related to leptin- and insulin-resistance... more on this in future blogs. How do you know if your hormones are out of balance? I combine a careful history of what my patients are experiencing, their nutritional status, level of activity/lifestyle and sleep along with symptom questionnaires and testing. If any part is left out, we may miss the root cause of the hormone imbalance. Dr. John Lee's books are helpful with understanding symptoms, and I will provide those below with some modifications I've made. If you are taking the questionnaire, check off any symptoms that you experience from each symptom group, then we'll integrate at the end. Cyclical headaches (menstrual or hormonal migraine)? Excess hair on face/chest/or arms? Hyper- or hypo-glycemia and/or unstable blood sugar? For assessment, tally the total number of symptoms in each category. If you have 2 or more symptoms from a grouping - you may have the following diagnosis. I recommend you sort this out with an integrative physician. Group 1: Progesterone deficiency. This is the most common hormone imbalance of all ages. Best approaches are to optimize diet, reduce synthetic hormones if you are taking any (including birth control pills) and add bioidentical progesterone if appropriate. Group 2: Estrogen deficiency. This is most common in menopausal women, especially skinny minnies. Dietary changes and herbal therapies are often helpful as a first approach. Group 3: Excess estrogen. We see excess estrogen when women are taking synthetic estrogen, too much bioidentical estrogen (estradiol, estriol, tri-est), or are exposed to environmental xenoestrogens. Xenoestrogens refer to the 700+ chemicals in the environment that act like endrocrine disruptors in the body, usually by binding the estradiol receptor. Xenoestrogens have estrogen-like effects such as fertilizers, pesticides and lauryl sulfates. Group 4: Estrogen dominance. Usually caused by not having sufficient progesterone to balance estrogen. 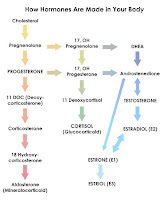 Causes vary from not enough progesterone to too much estrogen, or as is common in premenopause (age 35-50): low estrogen but superlow progesterone. Group 5: Excess androgens or male hormones. Often this is caused by insulin and/or leptin resistance, and we can reverse this with dietary changes and supplements, but other approaches are effective as well. Group 6: Cortisol excess or deficiency. Most people need a laboratory test to differentiate. This is caused by adrenal fatigue which results from chronic stress. I find very few women survive work and kids without some degree of adrenal fatigue. There also is interdependence among these different hormonal systems with each other as well as with neurotransmitters. For instance, estrogen acts like a selective serotonin reuptake inhibitor and helps mood in many women. Also, if adrenal hormones are off, this can interfere with conversion of T4 (inactive thyroid hormone) to T3 (active form of thyroid hormone). For all of these conditions or for further information, I recommend consulting an integrative physician in your area such as those in this database. This article is really useful, Thank ! I'm an organic gynecologist, yoga teacher + writer. I earn a living partnering with women to get them vital and self-realized again. We're born that way, but often fall off the path. Let's take your lousy mood and fatigue, and transform it into something sacred and useful. Information on this web site is provided for informational purposes only. The information is a results of years of practice experience by the author. This information is not intended as a substitute for the advice provided by your physician or other healthcare professional or any information contained on or in any product label or packaging. Do not use the information on this web site for diagnosing or treating a health problem or disease, or prescribing medication or other treatment. Always speak with your physician or other healthcare professional before taking any medication or nutritional, herbal or homeopathic supplement, or using any treatment for a health problem. If you have or suspect that you have a medical problem, contact your health care provider promptly. Do not disregard professional medical advice or delay in seeking professional advice because of something you have read on this web site. Information provided on this web site and the use of any products or services purchased from our web site by you DOES NOT create a doctor-patient relationship between you and any of the physicians affiliated with our web site. Information and statements regarding dietary supplements have not been evaluated by the Food and Drug Administration and are not intended to diagnose, treat, cure, or prevent any disease. Fibroids - Say "No" to the Knife!